The United States’ State department’s readout on the meeting between the Secretary of State Mike Pompeo and Nepal’s Foreign Minister Pradeep Gyawali highlights Nepal’s “central role” in the Trump administration’s Indo-Pacific vision, which naturally raises questions in Nepal and elsewhere about the meaning and implications of this for Nepal. The Indo-Pacific strategy is not entirely new. The US has been a dominant maritime power in Asia for decades. In recent years, it started to refer to the larger Asian region from the Pacific to some part of Indian ocean as the Asia-Pacific region. And now with India’s increasing regional role and ambition, and deepening US-India defense partnership, the Trump administration recognized the importance of India’s role and in its national security strategy for the first time used the term “Indo-Pacific.” Different parties, from Australia to India and others, claim to have coined this term, but overall it is understood that it was originally Japan’s initiative to create a larger regional architecture to counter China’s active global outreach, and now the US takes the lead for that. The Indo-Pacific region, concept, and framework is not yet fully defined, and the US is still working on to develop content to the Indo-Pacific with partners such as Japan, Australia, India and others to further develop partnership under the Indo-Pacific framework. As understood so far, it is a vast area covering entire Pacific Ocean to the Indian Ocean up to the eastern coast of Africa, and includes land that surrounds these two oceans. Since Nepal lies on the rim of the Bay of Bengal, a north eastern corner of the Indian Ocean, which connects South Asia with Southeast Asia by land, it is being seen as an important nation in the Indo-Pacific region. In the context of India’s Look East and Act East policy, Nepal has gained further value in all this. The Indo-Pacific has two parts: one is strategic or security side, and the other is the economic side. While the security side is still unclear and there are several disagreements on this among major countries that support Indo-Pacific; there is a possibility of a quasi-military alliance such as QUAD, or a quadrilateral grouping that includes US, India, Japan and Australia, but no significant progress is taking place in its negotiations. At present, there is a lot of uncertainty and unpredictability in Washington itself under President Trump. But on the economic side these countries converge and have already introduced several economic initiatives in a single, bilateral and tri-lateral formats. The US is going to establish soon the International Development Finance Corporation(IDFC) which will re-strengthen its old Overseas Private Investment Corporation (OPIC) with the Congress funding of 60 billion US dollars, and allows the IDFC to even buy equities unlike the OPIC which can pose a solid challenge to Chinese investment around the world. For the most part, this mechanism will focus on Africa, as the Trump administration has also introduced its Africa initiative. Similarly, India and Japan have introduced Asia-Africa growth corridor, and Japan-Australia-US have announced further investment in the Pacific region, and so on. Even in the US policymakers are re-considering its one-dimensional military power approach – the architect of “Asia pivot” policy under the Obama administration, Kurt Campbell recently said in an interaction program in Washington that if the US wants to convincingly engage with its partners in Asia, it has to go beyond its solely military interests to other non-military aspects as well, such as, aid and development, and diplomacy. Because in Asia, countries also want to work and get the benefits from their partnership with China. As far as Nepal is concerned, the US’s emphasis on Nepal’s role in the Indo-Pacific is an opportunity for Nepal as it is an unprecedented window for Nepal that can lift Nepal from its geographical constraint of being pressed between India and China which it has always sought. In Nepal’s case, its geopolitical conditions are different from countries which are in military alliance or similar groupings, therefore, it is not entirely relevant for Nepal. ; Nepal does not face any direct threat for its sovereignty in the neighborhood. It is also not logical to argue that any military-type alliance would lead Nepal to the same fate as Afghanistan’s. The critical strategic location value of Afghanistan, its history and social, pollical and cultural structure is totally different from those of Nepal. Nevertheless, Nepal can benefit tremendously from the economic side of the Indo-Pacific. With a little bit of imagination and increased investment in country’s diplomacy, Nepal government can work on taking the lead in the region and beyond benefiting from the US partnership, and increasing its own regional weight and diplomatic clout, which otherwise has always been depressed under India’s which is the elephant in the room. Rather than just limiting ourselves in the traditional way of receiving aid money whenever given and accepting the patronage, political engagement of this level will give us a chance to increase Nepal’s diplomatic clout. Any Nepali diplomat or individual engaged in the sector knows that Nepal is invisible in the international diplomatic and strategic arena. It is almost impossible to get time form high level official unless they want us to come to listen to their advice or receive grants in their terms. Thinking about these global initiatives merely in ideological terms will not help Nepal. Nepal signed China’s BRI, which does not mean that Nepal is being part of China’s global hegemonic ambition or China’s take on the US leadership. Similarly, signing into the Indo-Pacific does not mean that Nepal is being used to uphold US hegemony or its containment strategy vis-à-vis China. It will also be incorrect to claim that Nepal is of the biggest strategic value for the US in the region, as the power relations are shifting, Sri Lanka is emerging as equally important nation, if not the most important South Asian and Indian Ocean nation, and the US has made very clear in recent days how much emphasis it is willing to give to the nation. In the US there is definitely a confusion about the fact that why Nepal or other smaller nations do not get along with India. And regarding India, the US still lacks a deep understanding about what is India and its behavior in the neighborhood. The US-India relationship itself is very new. I myself asked the principal deputy assistant secretary for South and Central Asia, Alice Wells, whether the US and India are planning to twist arms of Nepal and other South Asian nations, in the answer she clearly said that the US will not support any policy that would undermine the sovereignty of these countries, and emphasize that the US and Nepal should build partnership upon its own deep ties, therefore the Indo-Pacific is an opportunity for Nepal. Besides, the US policy on South Asia is not solely about aligning with India’s interests and helping India, the US interest is also to make sure that India and China will come too close, in which Nepal has a space to maneuver. While China itself is increasingly worried about the Western resistance of BRI and America’s anti-China policies, Nepal fully relying on potential help from China will not be wise. The US- led rules and regulations for financial and trade policies and dollars as the main international currency will continue, thus Nepal simply cannot ignore the US leadership. Therefore, Oli government’s policy to engage with all its partners for Nepal’s best interest is a right policy, and the Indo-Pacific can help Oli government to show some tangible benefits. And the argument that by being part of the Indo-Pacific, we are further constrained under India’s dominance is not entirely relevant. The Indo-Pacific is clearly an opportunity if carefully taken and worked out. For instance, if the US is set to found a regional institution for Indo-Pacific or China for its BRI, Kathmandu can offer to host them, which will increase Nepal’s stature. And why not? Nepal has the ability and has had very good relationship with China and has managed its relations in South Asia very well except some hiccups in its relationship with India which are attributed to India itself than Nepal. Nepal’s independent role in South Asia vis-à-vis India will not annoy China as much as it would to India, but the US’s Indo-Pacific partnership will certainly enable Nepal this time to convince India. Dr. Anil Sigdel is the director at Nepal Matters for America in Washington DC, and the Member Secretary of Nepal Policy Institute (NPI) under the Non-Residential Nepali Association (NRNA), a partner think tank of Nepal government. Dr. Sigdel holds a PhD and a Master degree in International Relations. The visit signifies the growing convergence between the two nations, which of late was labeled as a secondary kind of relationship, in that while the US is prioritizing Nepal in its Indo-Pacific vision, in Nepal also there is growing realization of strongly “reviving” its ties with the long-time friend US. In the quickly changing dynamics of South Asia, Nepal especially being a nation sandwiched between the giants China and India, the US-Nepal relationship has a particular significance in terms of Nepal’s peace and stability, democracy and rule of law, and economic growth and development. It is particularly important to note for stakeholders on both sides that Nepalis want result-oriented policies from its old allies especially in the time in which Nepal has new options available and new narratives are becoming stronger. Nepal is the 12th biggest source of international students in the US universities. About 300, 000 people of Nepali heritage live in the US. Every year thousands of Americans visit Nepal. The US is the biggest development donor of Nepal at present. The US is willing to commit more fund for Nepal’s infrastructure development and regional connectivity in South Asia. Nepal’s Foreign Minister Pradeep Gyawali is all set to visit Washington DC from December 17-21. He will accompanied by Nepal’s Foreign Secretary Shanker Bairagi, and the US Ambassador to Nepal H E Randy Berry will arrive in DC soon. The visit is quite significant since after 17 years the foreign ministerial meeting is going to take place. Minister Gyawali will lead bilateral consultations with his American counterpart, and will also conduct discuss areas of economy and trade, security and developmental aid, people-to-people relations among others with high level officials from different agencies in Washington DC. Jennifer Loy interviews Retired Major General Rajiv Narayanan from India, Distinguished Fellow at the USI of India, on China ’s OBOR/BRI and the motivations behind it. Q: In a simple way, can you explain China’s One Belt One Road (OBOR)/Belt Road Initiative (BRI)? A: It is the deployment of the Chinese overcapacities of their factories and their labor to enable China’s growth. Concurrently, it plans to utilize this opportunity to gain geo-strategic space in Asia, especially East, SE, South and Central Asia. Q:Do you believe Xi Jinping’s intentions are truly economic and almost nation-building, or do you think there are military motives as well? A: Xi Jinping’s intention are purely to gain geo-strategic space using the geo-economic squeeze / ‘debt-o-nomics’ to ensure that it garners enhanced space for PLA to sustain itself well beyond its borders, viz., Gwadar, Hambantotta, Djibouti. Q:The BRI is an incredible endeavor, a modern Silk Road. How is the Chinese government funding this project? A: The BRI is not something that was started by Xi Jinping. Most of these projects were on going under Hu Jintao, and a few under Jiang Xemin, viz., Hambantotta port construction began in 2009. Xi Jinping has coined this phrase and clubbed all these ongoing projects under one umbrella. Anyway, the Silk Route was not one road but a multiplicity of roads, connecting China, Central Asia, South Asia and West Asia. Under the umbrella of BRI, only one corridor, the China – Central Asia – West Asia corridor corresponds to the ancient Silk Route. Q: How do the Chinese people view such an extensive project? A: The common man is only able to read what the government wants him to know. The media and internet censorship within China is very harsh. As such he / she can only mouth what the Communist Party of China wants them to know. Q: BRI projects would truly benefit the host nation if locals are employed. Where are examples that they have been? A: The BRI project is to provide jobs to the Chinese and not to the host countries. Very limited labor is being utilized from the host country – the CPEC is a classic case in point. Q: In Xi Jinping’s first address to the UN in 2013, he stressed, “We should build partnerships in which countries treat each other as equals, engage in mutual consultation, and show mutual understanding.” What can you say to this in terms of the BRI? A: What XI Jinping stated was only meant for media consumption and for the US and West to treat China as equals. The manner in which the BRI has been invoked, and made part of the Constitution, tells the story. No host country was even consulted. India has never coveted another country’s territory, but China creates issues by specious territorial claims and creeping assertiveness – as it has done in the South China Sea. Post the 1962 fiasco, India has learnt its lessons, and the in subsequent border battles in 1967 in Sikkim China was decisively defeated. Similarly, in 1987 when China tried to create an incident in Arunachal Pradesh (Sumdurong Chu), it was surprised by India’s response and China blinked, pulled back and it led to the meeting between Den Xiaoping and PM Rajiv Gandhi. The Doklam standoff in Bhutan is a lesson to the major powers that if it militarily supports a smaller nation it can stand up to China’s arm-twisting, like Bhutan did with India’s support. Q: India appears to be losing influence in Nepal, Sri Lanka, and the Maldives. What do they need to do to regain this, or should they wait and see how the BRI aids the region? A: Loss of influence depends on long term interests, and that I do not think will change in any of the three countries. Though temporarily it may seem so, the economic dependency cannot be wished away. All three understand that trade with China is not a viable option, but as with any country, they would prefer to hedge between two major countries to maximize the gains for their country. Q: A couple months ago, India and China “reset” their relations. Was this for show or do you think it has worked? A: China seems to understand that in the near to medium term, rapprochement with India would be a win-win for all. The two major powers in Asia need to work together and build on the convergences rather than allow the divergences to create sensitivities that could lead to avoidable contest. As such, India is ready to work with China for the larger good of the region. Q: It appears Nepali Prime Minister Oli is interested in increasing relations with China. Besides China Telecom Global and a Beijing funded railway into China, what other projects will Nepal benefit from with the BRI? A: No corridor of the BRI touches Nepal. So, at best Nepal can look towards a link that could then connect it to the Central Asia-West Asia corridor. Any infrastructure needs to be economically viable to be able to repay the loans provided for executing the same. Hence, the projects that China proposes needs to be closely scrutinized for its economic viability. Accordingly, Mr Oli, Nepal’s prime minister, has stated categorically that concurrently he desires to maintain good relations with India also. Q: How far do you think Sino-Nepali relations can extend before India intervenes, perhaps militarily? A: Why would India intervene militarily at all? Nepal has very close relations with India, and it still continues. The Nepalese do not need any visa to visit India, or any work permit to take up jobs here. This will continue. So despite good relations with China, Nepal will also maintain its traditional relations with India – it’s not a zero-sum game. Q: In 2017 at the World Expo in Astana, Kazakhstan, the China Pavilion was concerned with clean, green technology. How have they already taken steps to implement this within the BRI? A: It does not seem so, as is evident from the projects planned for CPEC. Pakistan currently is electricity grid based on gas fired technology – considered rather green; but the energy grid being made by China is mostly Thermal that is not green. Q: Chinese tourists make up the largest percentage in the Maldives. How will the BRI improve the Maldivian economy besides tourism? A: The BRI will not improve Maldivian economy, since the infrastructure costs are not covered by the visiting tourists. Thus if Maldives goes ahead with executing projects without any assessment of their economic viability, it could also end up in a debt trap like Sri Lanka and Myanmar (Pakistan?). Q: Besides the 99-year lease on the Sri Lankan port of Hambantota, how else will the BRI affect the island nation? A: The nation is already in a debt trap. It needs to carefully weigh the fine print for the other projects that China has proposed around Colombo. Q: The landlocked Kingdom of Bhutan is secluded and unique because of its geography as well as its environment and lifestyle. Will the BRI affect it? A: No. It has no connectivity with China. The Nation does not look at GDP but at Gross National Happiness (GNH). Q: Bangladesh is often a forgotten South Asian nation. It is poor and suffers from great infrastructure concerns and it would greatly benefit from the BRI. Are there any such projects? A: The India – Bangladesh – Myanmar – China project that was already in place had been unilaterally subsumed by China into BRI, which India has objected too. China is going slow on this project. However, due to the debt issues being faced by Sri Lanka and Myanmar, Bangladesh is wary of projects with China and is carefully selecting only those that would be economically viable to it. Q: What are the prospects for Gwadar and Kyaukphyu as Indian Ocean ports for China to decrease sea shipping? A: Neither would reduce China’s maritime trade footprint. Q: How is the “China Model” affecting nations in Africa? A: The ground swell against ‘China Model’ of exporting its men and material for execution of projects is rising. Q: The BRI will extend to Europe eventually. Explain those that are and are not interested and their reasoning. A: The extension of BRI to Europe is basically for optics and is not economically viable. The train from Yuili (Eastern Seaboard of China) to UK took 21 days and carried 200 x 20 ft containers. There were 11 x transshipment involved. Due to this, in a month only about 10 trains can run in a month, i.e., 2000 x containers can be shipped to UK. Compared to it the larger container ships can carry 12000 x 20 ft containers with almost 20 x ships being handled in a month, i.e., 240,000 x containers can be shipped in a month. The economics are stark. Q: Xi described the BRI as a “win-win” for the nations involved. I understand it is too soon to truly tell. Regardless, what needs to happen for it to be a “win-win” for those involved? A: As has emerged from the experience of both Sri Lanka and Myanmar, the win-win appears to be only for China – win in the near term and another win in the medium to long term. In the near term it gains space and in the medium term with geo-economic squeeze due to debt it gains geo-strategic space. Jennifer is Research Associate at Nepal Matters for America in Washington. 4. How do the Chinese people view such an extensive project? 6. In Xi Jinping’s first address to the UN in 2013, he stressed, “We should build partnerships in which countries treat each other as equals, engage in mutual consultation, and show mutual understanding.” I feel this does not prove true today with Sino-Indian relations, especially as China is gaining influence in South Asia. What can you say to this in terms of the BRI? Why China is coming to Central Asia? Although China is a very important trading partner[i] for the former Soviet republics of Central Asia (Kazakhstan, Kyrgyzstan, Tajikistan, Turkmenistan and Uzbekistan), those same five countries together make up for only around 1% of all of China’s trade. [ii] Regarding trade, China[iii] mostly imports metals and mineral products (mainly petroleum gas and crude petroleum)[iv] and exports machines and textiles (mainly cotton)[v]. In both cases, Central Asia does not represent a significant source of import and export for China, even if trade has been steadily growing. So, why has China been attempting to enhance its relations with this region with a more assertive foreign policy, devising the so-called New Silk Road? [vi] The following paragraphs will briefly examine what scholars say about this. From the perspective of Central Asia however, as Naarajärvi (2012, 113) concludes, “the actions and presence of China and Russia in Central Asia, together with inherently inauspicious characteristics of the region when compared to the post-Cold War new regionalist thinking, hinder the overall regionalisation in the area.” Also, “Central Asian states are at once desirous of the growing Chinese presence, wanting to take advantage of its economic dynamism and geostrategic influence, but also fearful of its potential demographic and cultural clout” (Peyrouse 2016, 14). It would seem that even though China’s strategy in Central Asia is clear, the existing complexity of relations, geostrategic importance of the region, and the political instability of the five countries makes it particularly difficult to gauge the consequences, impacts and possible combination of outcomes due to the diversity of actors and interests. Undoubtedly, the presence of China in Central Asia has been on the rise and while most look at the region from the perspective of interplay between China, US and Russia,[x] it is important to stress that in Central Asia itself there “is a predominant suspicion that China still has imperial designs on Central Asia and merely wants to conceal or delay them” (Peyrouse 2016, 22). Janja is Academic Research Consultant at Nepal Matters for America. [ii] In 2016, all of China’s imports amounted to $1.32T and all its exports to $2.06T. [iv] China controls large portions of the oil and gas fields in the region and is behind a large share of the investments in the region (Swanstörm 2005, 584). [vi] The idea of a new “Silk Road economic belt” was launched by President Xi during his tour of the Central Asian republics in October 2013 (Rolland 2015, 1). [vii] Russia is promoting its integration policy in the region primarily through the Eurasian Economic Union and the Eurasian Development Bank, while China uses the Shanghai Cooperation Organisation and the Asian Infrastructure Investment Bank (Muratshina 2017, 97). [viii] As Ferdinand points out, there aren’t only possible political risks of instability in Central Asia, but also “the danger of an increased Chinese presence in neighbouring regions stimulating fears about Beijing’s long-term intentions” (2016, 952). [ix] Historically, the “PRC has done little to influence Central Asia, partly due to its own instability along its periphery, and internal problems in the Chinese heartland” (Sheives 2006, 205). Ferdinand, Peter. 2016. Westward ho—the China dream and ‘one belt, one road’: Chinese foreign policy under Xi Jinping. In International Affairs 92(4): 941-57. Iqbal, Musharaf and Manzoor Khan Afridi. 2017. New Great Game in Central Asia: Conflicts, Interests and Strategies of Russia, China and United States. In The Dialogue XII(3): 229-46. Kavalski, Emilian. 2007. Partnership or Rivalry between the EU, China and India in Central Asia: The Normative Power of Regional Actors with Global Aspirations. In European Law Journal 13(6): 839-56. Ma, Jiliang, Tomas Balezentis, Zhijun Zhao and Cheng Fang. 2017. One Bely One Road (OBOR) Initiative in Central Asia: The study of OBOR on China and Central Asia agricultural trade. In Transformations in Business & Economics 16(3): 41-55. Muratshina, Ksenia. 2017. Asian Infrastructure Investment Bank and post-Soviet Central Asia: New Multilateral Bank Formation in the Context of China’s Economic Interaction with post-Soviet Central Asian Countries. In Central European Journal of International and Security Studies 11(3): 84-106. Naarajärvi, Teemu. 2012. China, Russia and the Shanghai Cooperation Organisation: blessing or curse for new regionalism in Central Asia? In Asia Europe Journal 10: 113-26. Odgaard, Liselotte. 2017. Beijing’s Quest for Stability in its Neighborhood: China’s Relations with Russia in Central Asia. In Asian Security 13(1): 41-58. Peyrouse, Sébastien. 2016. Discussing China: Sinophilia and sinophobia in Central Asia. In Journal of Eurasian Studies 7: 14-23. Rolland, Nadège. 2015. 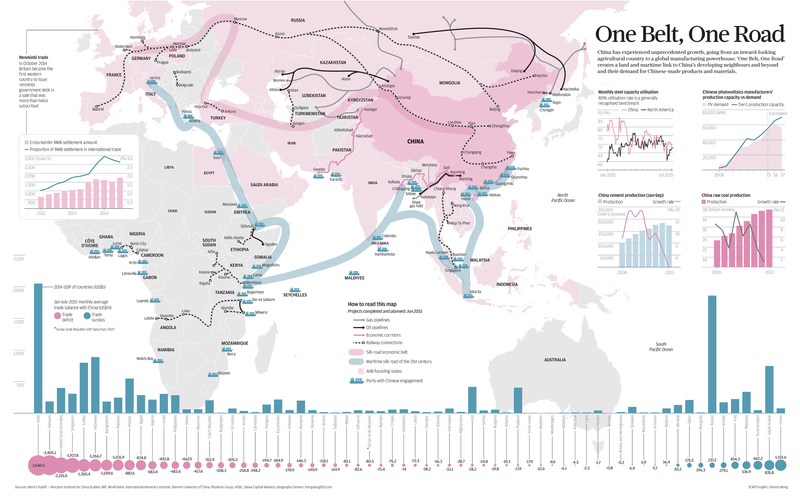 China’s New Silk Road. Washington: The National Bureau of Asian Research. Samokhvalov, Vsevolod. 2018. Russia and its shared neighbourhoods: A comparative analysis of Russia-EU and Russia-China relations in the EU’s Eastern neighbourhood and Central Asia. In Contemporary Politics 24(1): 30-45. Shambaugh, David. 2005. China engages Asia: Reshaping the regional order. In International Security 29(3): 64-99. Sheives, Kevin. 2006. China Turns West: Beijing’s Contemporary Strategy Towards Central Asia. In Pacific Affairs 79(2): 205-24. Swanstörm, Niklas. 2005. China and Central Asia: a new Great Game or traditional vassal relations? In Journal of Contemporary China 14(45): 569-84. Zhi, Wang. 2016. China’s New Silk Road Strategy and Foreign Policy Toward Central Asia. In Southeast Review of Asian Studies 38: 69-77.